Oncology nurses play a fundamental role in cancer care, with the potential to influence and improve the quality of the cancer system at every level. Cancer is the number one killer in Hong Kong, and in many other countries in the world, the demand for oncology care services will continue to grow. It poses significant demands on the health-care resources as well as the development of the professionals. With the dedication and concerted efforts of the oncology nurses in Hong Kong and our medical and other health-care professionals, the advance oncology services can be provided in Hong Kong. Discussion about oncology nursing development is almost nonexistent except a single article published in 1997 that was already two decades ago. Although in the 1990s, the nursing roles in cancer care were limited, from the 2000s onward, there was an expansion of the diversity of roles and practice settings, reflecting the importance of contribution by nurses to clinical practice and service for cancer patients. These areas include advanced roles and competence development, advanced training framework, service delivery model, strong cross-cluster collaboration, quality improvement (QI) initiatives, new nurse clinic model, advocate for cancer nursing at an international platform, and advanced practice nurse accreditation. The Eighth Nursing Symposium on Cancer Care 2018 warrants a review of the development of oncology nursing in Hong Kong. The evolution of oncology nurses' role, training, education, practice, and service provision in Hong Kong is the focus of this article, which aims to present an overall picture of the development in the field, highlight milestones over the past two decades, and provide directions for future training, practice, and research. Before mid of 1990, the major cancer treatment method was surgery, and nursing care of patients with cancer was seen as occurring in two different categories: those that require postoperative care for operative cancers and those that require end-of-life care for inoperative cancers. The role of the nurse was limited to inpatient care of the hospitalized patients. As chemotherapy and radiation therapy evolved as treatment methods, nurses looked for opportunities to contribute to cancer care. It was not until the 1990s that major advances occurred in the areas of cancer treatment and oncology nursing. Cancer survival rates improved, and nursing experienced a shift that expanded roles and acknowledged the importance of professionalism in nursing. The fight to advocate for oncology nursing development in HK began with the building of the first tertiary referral center – the Sir Yue-Kong Pao Centre for Cancer in the Prince of Wales Hospital (PWH) in 1994, which is devoted to cater for cancer problems as well as research study today. At that time, there was no formal specialty educational program in HK. The first implemented in HK was a certificate course conducted by Hong Kong University SPACE in 1993, which adopted from the core curriculum of the European Oncology Nursing Society. Then, the Department of Clinical Oncology at the Chinese University of Hong Kong (CUHK) implemented a specialist course in Cancer Nursing Care in 1995 and continued to run for 5 years, which has had an important impact on our subsequent oncology nurse development by cultivating many nurse leaders in the field. In late of the 1990s, the nurse specialist (NS) became part of nursing career structure in HK, all of the five oncology centers at that time when the sixth in the Princess Margaret Hospital (PMH) has not been built had NS, and the center at the PWH even had two NS for service needs. The scheme was so successful and fully supported in oncology specialty that the NS efforts have also had a direct (i.e., improved or newly developed specialty care through research study and evidence review),,,,,,, or indirect impact (i.e., through structure being more effective and leading to better quality nursing practice) on the development of oncology nursing. In January 1999, the first Nursing Symposium on Cancer Care was conducted in HK, which was initiated and organized by the Department of Clinical Oncology, CUHK. Until 2002, the Nethersole School of Nursing, CUHK, played a major role in sustaining and organizing this symposium that has become a significant event to every nurse who is engaged in cancer care in HK and worldwide. Nursing roles involved in cancer care before 2000 commonly include direct care provision in inpatient, limited ambulatory, and outpatient care, home hospice setting, patient education, and management, research mainly in coordination rather than being an investigator. As oncology nursing has evolved as a specialty in HK, the need for training in subspecialties including chemotherapy and radiotherapy increased. Many depended on studying aboard. Some pioneer nurses were supported through initiatives by the department to go to overseas cancer hospitals to receive training, and the role of the oncology nurse changed from traditional bedside care to more complex integration of knowledge and technological advances and psychosocial care. From the late 1990s to 2000s, cancer treatment consisted of extensive surgery or radiation therapy, or intensive cytotoxic drug therapy, or a combination. The toxicities associated with these regimens required skilled nursing care management by highly specialized nurses. Further, oncology nurses routinely administered IV chemotherapy, provide onsite support at linear accelerator to patients undergoing radiation therapy, deliver care to patients suffering from cancer treatment-induced lymphedema, and there was an increasing recognition of the oncology nurse's role in research and nurse clinic. There are structured specialty training programs provided by hospital authority (HA) with postregistration certificate course (PRCC) in oncology nursing starting from 2008. For entry into oncology nursing practice, nurses require specialty certification course. After the specialty certification course, there are also advanced training programs in the subspecialties such as chemotherapy, radiotherapy, or therapeutic apheresis, which are to prepare the specialty nurses for taking advanced roles. Some of them have nowadays become HA officially and regularly conducted specialty training programs. As the nurses' role in cancer care has evolved to more complex, other related specialties, PRCC in palliative care, hematology and bone marrow transplant, breast care, etc., are also available in HA. The cancer care needs and the role of oncology nurses are interrelated. Cancer service nursing roles were then extended to QI and clinical researcher. Furthermore, nurses already develop specialization in care of patients with cancers by three levels – (1) specific cancer diagnoses (e.g., hematology nurse for leukemia and breast care nurse for breast cancer disease), (2) treatment modality (e.g., chemotherapy nurse and radiation oncology nurse), and (3) aspect within the continuum of cancer care (e.g., palliative nurse and cancer case manager). HA vigorously develops the cancer case manager and its practice is based on the multidisciplinary team (MDT) concept. The program was launched since 2010/2011, targeting patients with breast and colorectal cancers. Oncology nursing also developed with the rapid development of the nursing career pathway in HK. The NS role was first piloted in 1993 and an advanced practice nurse role in 2003. The new nursing career progression model was promulgated in 2008. The nurse consultant (NC) role was implemented in 2011. The first oncology NC being in the post was in 2012 in PWH. There are already six oncology centers in HK, and one oncology unit is operating limited service in United Christian Hospital. There are up till now only three oncology NCs serving in HA. There has not yet been any oncology-related nursing association in HK. There are the specialty-based committee and workgroup set up by HA, which serve as an official platform for clinical leaders from different specialties across different clusters/hospitals to deliberate issues including manpower, training, services, quality, technology, and therapeutics for its respective specialty to achieve more standardized service quality and treatment and to ensure safety. Coordinating Committee (COC) of clinical oncology is a committee more medical oriented. Members not only have doctors but also representatives from physicist, radiation therapist, nurses, and pharmacist. Specialty advisory group (SAG) of oncology nursing is an advisory group seated by nursing clinical leaders that serve similar roles of COC in clinical governance. Oncology nursing has a crucial cross-cluster QI initiative in HK that is to streamlining the pathway of care for cancer patients at the risk of chemotherapy-induced febrile neutropenia (FN). Nurses from the six oncology centers champion the QI effort and empower staff to engage in and move the initiatives forward, which took a long time from 2012 to 2016 and a concerted effort from collaboration between different disciplines and parties. This project has won an Excellence Award in the category of Patient Safety Project in Asian Hospital Management Awards organized by the Hospital Management Asia in 2017. The award recognized our initiative over the years to enhancing patient's self-care and awareness and facilitating earlier triage and prompt access for antibiotic treatment for patients at risk for chemotherapy-induced FN through a streamlined cross-department fast-track care pathway, developing guidelines to identify the high-risk group of patients for priority of management, nurse clinic providing specific chemotherapy regimen-based education, and use of alert card and electronic alert. The door-to-antibiotic time in the six centers was all significantly shortened in 2016 after the new care pathway compared to 2012/2013. The result was satisfactory when compared with similar studies conducted in the UK, Europe, and North America. HA has started to establish nurse clinics since the early 1990s. Conventional nurse clinics mainly follow-up on the cases referred by a doctor for symptom management and health education for patients. After the 2016 review, a reviewed model is formulated with a modified approach. There were accredited clinical oncology nurse clinics in all six oncology centers. The core service has three foci including radiotherapy, chemotherapy, and supportive/palliative care. Service scope is mainly on symptom management and has moved more and more to toxicity review and drug/treatment compliance in recent years. Oncology nursing in PWH has early developed a prototype of oncology nurse clinic system with three tiers of nurse clinics to meeting the service needs. The first tier is therapeutic education; the second tier is cancer treatment review. The third tier focuses on review, management, and follow-up of the symptoms and/or invasive implanted devices such as central venous tunnel catheter and implantable port which are commonly used in oncology patients. In 2017, PWH was invited to publicize the development of PWH oncology nurse clinic in a media interview and presentation in HA convention, which then cause impact by gaining recognition on the potential development of nurse clinic in the oncology field. The nurse-managed chemotherapy clinic has been early explored in some of the hospitals such as Pamela Youde Nethersole Eastern Hospital  and PMH. The best recognized is nurse-managed chemotherapy treatment review for adjuvant trastuzumab. Radiotherapy nurse clinic has been run a long history in some of the oncology centers such as PWH and Tuen Mun Hospital for patients suffering from acute side effects during 5–7 weeks of radiotherapy treatment. The budget support was bid from HA with success of the new model. 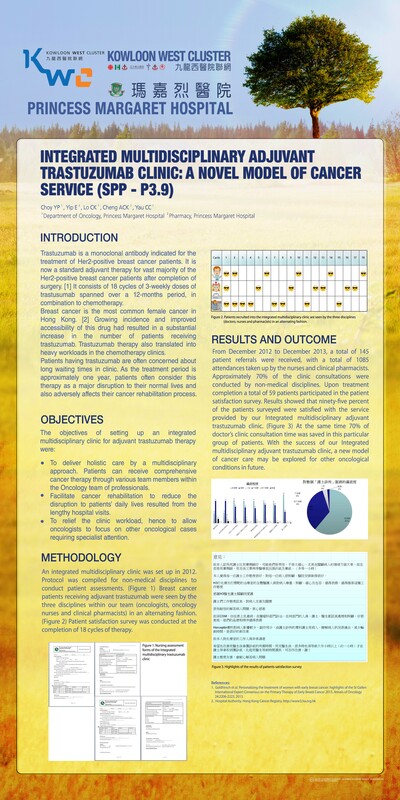 Clinical oncology is the pioneer to incorporate “Integrated Model of Specialist Out-patient Service through Nurse Clinic” to the head and neck cancer patients undergoing radical radiotherapy, which aims to provide close toxicity monitoring and support to improve patient outcomes and reduce doctor radiotherapy on-treatment consultation visits. Ongoing monitoring on the service provision and nurse clinic performance would be performed by measuring the outcomes in different levels, including symptom control, for example, excess weight loss and health service utilization, for example, emergency department visit, unplanned visit or admission. In 2016, the International Conference on Cancer Nursing (ICCN) was conducted in HK. Local oncology nurses liaised with the HK College of Medical Nursing to be the conference partner collaborating with the International Society of Nurses in Cancer Care and the Chinese Nurses Association to co-host the ICCN 2016 in HK. The event is successful with 377 attendees from 34 countries. Another important event was the establishment of the Asian Oncology Nursing Society. Both clinical and academic forces from HK oncology nursing collaborate to support its development and its first conference conducted in Bangkok in 2013. Cancer is the top killer in HK causing 1 in 3 of deaths. By 2030, it is estimated that the cancer incidence is 35%. Moreover, there is rising cancer incidence for younger age groups. Ninety percent of new cancer cases in HK were diagnosed or treated in HA. There is a significant growth in cancer populations compared to other chronic diseases escalating pressure on cancer services in HA. There was the rapid growth of patients who are in need of ongoing access to cancer treatment or oncology care in public or private settings, thus causing an increasing demand for specialized nurses functioning both as generalists and as advanced practice nurses. Increased drug pricing contributes to debilitating financial toxicity. Drug funding availability and affordability have become major concern before considering a new drug. The government proposed voluntary health insurance scheme has been in progress, which aims to encourage people to use private health-care services and relieve pressure on the public health-care system in the long term. Impact on the health-care market is expected. There is long waiting time to cancer treatment in HA. Both colorectal and breast cancer patients also have long waiting time to treatment longer than 60 days key performance indicator. The policy address proposes that the HA will set up more nurse clinics and seek to achieve better results by deploying MDT. The most rapidly changing area in oncology practice should be the substantial advances in biologic anticancer agents. Called “precision medicine” due to the identification of molecular targets that can be matched to specific tumor characteristics, many patients now truly receive individualized treatment planning that is more likely to benefit them, based on precise molecular diagnostics. Testing has advanced to next-generation sequencing diagnostics for dozens of mutations, amplifications, or gene rearrangements from a single sample and testing can be accomplished for some mutations using urine or blood samples when tissue is unavailable. These advancements do exert impact on nurses' practice and operation. Furthermore, immunotherapy is still very new to most of the oncology nurses; nevertheless, it is increasingly becoming the standard of care for many types of cancer. Immunotherapy with checkpoint inhibitors blocks the body's natural safeguards that prevent immune overactivation and it can also affect healthy cells and normal tissues and cause autoimmune side effects. These are different from those associated with chemotherapy and tumor-targeting drugs and require different management strategies. HA in 2018 has set up taskforce to formulate the Strategic Service Framework for Cancer Services that aim to guide the development of cancer services in the next 5–10 years that the related discussion and work are still undergoing. Effective oncology nurses must prepare for a lifelong learning environment, as the expectations for advanced care delivery will only increase as oncology care continues to advance. To assess and accredit the competency, it should be through a recognized accreditation system. The specialty nurse accreditation systems have been developed in the USA, Canada, and Australia to assess and accredit advanced practice nurse or nurse practitioner programs. Work has been underway by the HK Academy of nursing to have an accreditation function for advanced practice, but it is still in its early stages in HK. Over 50 oncology nurses have been accredited as oncology nursing fellows. Advanced practice nurse accreditation has been extended to private hospitals with great response. The need for specialty training in these private hospitals is catered by the course provided by universities. Patient with cancer and those undergoing anticancer treatment or those at the end of life are at risk for unrecognized side effect and inadequate symptom management. Oncology field relies heavily on nurses to help patient's symptom management. The need for access to nursing expertise in the management of symptoms associated with cancer treatment or cancer disease persists. Moreover, an oncology nurse who is engaged in nurse-led service must be skilled at the identification of the differential diagnosis as well as complex symptom management, to assure effective care of the oncology patient population. Therefore, the oncology nurse's knowledge of cancer or treatment-induced symptom physiology, pharmacologic, and nonpharmacologic interventions, complication screening, and complex symptom control is crucial to effective management. Borrowing expertise from overseas to provide training in local has become no longer enough to support our needs and practice. More and more advanced extended roles such as nurse-led consultation are provided in clinical service. However, there is a lack of clarity regarding the competency requirements for nurses with extended roles and no gold standard for educational attainment. The nursing council of HK has no standard on this yet. In the interim, it relies a lot on nurse clinic in-charge themselves how much they initiate to improve their competence. They are likely to offer a varied array of advanced skills and competencies when they embark on the role and develop along a continuum of expertise. In a 2012 position statement from the United Kingdom, Oncology Nursing Society, guidance on the nurse-led chemotherapy review clinics is provided in referencing the recommendation from another overview of nurse-led cancer clinics. Certain essential and recommended educational attainments as recommended in the following [Table 1] should provide insight and direction for HK oncology nursing in developing and supporting local training initiatives in advanced practice. As the advanced role becomes increasingly established with a view toward a future gold standard for educational attainment, the three key parties including clinical, academic, (i.e., universities), and professional bodies (i.e., HK College of Medical Nursing) should take the opportunity to work together to develop curriculum and support training initiatives in advanced practice. The number of survivors increases annually, so do the long-term care needs, concurrent comorbidity management, and increased complexity of this population. Australia and the UK developed new approaches to follow-up care that is shared care between cancer specialists and primary care according to risk-stratified pathways with positive results., Oncology nurses in HK who work in multiple care settings can prepare ourselves to learn the initiative to assure that holistic patient needs are addressed through the care continuum. There are many advances such as bar coding, scanning of medication, and smart pumps in clinical settings. Electronic prescribing of chemotherapy will be in the future. As there are lots of nononcology specific electronic health records, it is inevitable to compromise the essential documentation in oncology patients. Education kiosks and self-paced education modules have changed the modalities used by nurses for the education of patients and validation of their understanding. As there is shift for more and more technology-assisted traditional nursing tasks, the demand for highly technically skilled nurses will persist for complex patient populations, such as oncology patients. Nurses probably need to tune themselves by proactively educating patients regarding how to find and interpret reliable data on the Internet and prepare ourselves increasingly being called on by patients to interpret these data. Competent use of complex technologies in cancer care requires advanced skill in many aspects including communication, technical expertise, data analysis, and data security. Evidence-based translational practice to most of the nurses is not a new talk. However, it is interesting to ask how many nurses at clinical or administrative actually practice it. Oncology nurses are required to heavily rely on the evidence to inform treatment and management decision-making, especially as too many new therapies and evidence of their effectiveness emerge. To incorporate interpretation of scientific evidence into translational behaviors to assure safe and quality directed care, nurses must equip with new clinical knowledge; advances in oncology including all areas of patient care, such as prevention, detection, pharmacology, symptom management, and skilled care delivery, and essential competencies in multiple specialty realms including palliative care, genetics and genomics, critical care, and end-of-life care. Therefore, ongoing education and evaluation of emerging evidence is not a slogan but is a commitment to every oncology nurse, and even more, it is truly a key if we want to transform all those challenges to become our opportunities. This article celebrates the succeeding of Nursing Symposium on Cancer Care since its first in 1999 and the evolution of oncology nursing over the past more than 20 years, alongside recognizing that more work needs to be done in the future, and newer and more advanced practice foci as well as training initiatives in advanced practice need to be developed to meet the increased needs of increasing service load and populations in need of ongoing access to oncology care. The rapidly expanding cancer patient service brings either challenges or opportunities to the field. The role and the continuous efforts of the clinical, academic, and professional bodies, including nurses at different positions who are involved in the care of cancer patients to meet this goal, will be crucial and strategic in the future. This article was written on the basis of a presentation given at the Eight Nursing Symposium on Cancer Care 2018 held in Hong Kong, China, by the Nethersole School of Nursing, Faculty of Medicine, the Chinese University of Hong Kong. Mak JM. Oncology nursing: Professional development as a clinical specialty in Hong Kong. J Adv Nurs 1997;26:1086-90. Mak SS, Molassiotis A, Wan WM, Lee IY, Chan ES. The effects of hydrocolloid dressing and gentian violet on radiation-induced moist desquamation wound healing. Cancer Nurs 2000;23:220-9. Mun LY, Ping CM, Fai WK, Alexander M, Ki TY, Jing CS, et al. An evaluation of the quality of a chemotherapy administration service established by nurses in an oncology day care centre. Eur J Oncol Nurs 2001;5:244-53. Lee YM, Mak SS, Tse SM, Chan SJ. Lymphoedema care of breast cancer patients in a breast care clinic: A survey of knowledge and health practice. Support Care Cancer 2001;9:634-41. Mak SS, Zee CY, Molassiotis A, Chan SJ, Leung SF, Mo KF, et al. A comparison of wound treatments in nasopharyngeal cancer patients receiving radiation therapy. Cancer Nurs 2005;28:436-45. Mak SS, Yuen ML, Li C, Chan YK, Mo KF, Lee KM, et al. Explorative analysis for bacteriological status of post-irradiation wound and relation to healing. Clin Oncol 2006;18:519-24. Mak SS, Yeo W, Lee YM, Mo KF, Tse KY, Tse SM, et al. Predictors of lymphedema in patients with breast cancer undergoing axillary lymph node dissection in Hong Kong. Nurs Res 2008;57:416-25. Lee YM, Hung YK, Mo FK, Ho WM. Comparison between ambulatory infusion mode and inpatient infusion mode from the perspective of quality of life among colorectal cancer patients receiving chemotherapy. Int J Nurs Pract 2010;16:508-16. Mak SS, Mo KF, Suen JJ, Chan SL, Ma WL, Yeo W, et al. Lymphedema and quality of life in Chinese women after treatment for breast cancer. Eur J Oncol Nurs 2009;13:110-5. Central Oncology Committee Integrated Care Programs Department HAHO. Cancer Case Manager Program Operation Manual. Hospital Authority Head Office; August, 2011. Chan E. Advancing Nurses Contribution through a Clinical Career Pathway. College of Nursing 50th Anniversary Nursing Conference; 2014. Mak SS. How quality of oncology care and services be improved through leadership and collaborations: Cross-clusters CQI program in Hong Kong. Asia Pac J Oncol Nurs 2016;3:352-6. Hospital Authority. Outstanding Hospital Projects won 5 HMA Awards. HAS Link; September, 2019. Available from: http://www3.ha.org.hk/ehaslink/issue94/en/news-01.html. [Last accessed on 2018 Jul 26]. Lee SW. Review of Hospital Authority Nurse Clinic. HA Convention 2017. Proceedings Parallel Session PS3.3; 2017. Available from: http://www3.ha.org.hk/haconvention/hac2017/proceedings/downloads/PS3.3.pdf. [Last accessed on 2018 Jul 26]. Liu TK. Chemotherapy Nurse Clinic in Contributing the Clinical Pathway for Managing Post-treatment Complications with Improved Outcome. Hospital Authority Convention 2017. Proceedings Parallel Session PS3.1; 2017. Available from: http://www3.ha.org.hk/haconvention/hac2017/proceedings/downloads/PS3.1.pdf. [Last accessed on 2018 Jul 26]. Ling WM. The Challenges in Development of Effective Nurse Clinics. Hospital Authority Convention 2014. Proceedings Parallel Session MC9; 2014. Available from: http://www3.ha.org.hk/haconvention/hac2014/proceedings/downloads/MC9.pdf. [Last accessed on 2018 Jul 26]. Choy YP. Integrated multidisciplinary adjuvant trastuzumab clinic: A novel model of cancer service. Hospital Authority Convention 2014. Proceedings Poster Session SPP-P3.9; 2014. Available from: http://www3.ha.org.hk/haconvention/hac2014/proceedings/downloads/SPP-P3.9.jpg. [Last accessed on 2018 Jul 26]. Hospital Authority. Nurse Clinics Migrate to Integrated Model. HAS Link; 16-17 January, 2018. Available from: http://www3.ha.org.hk/ehaslink/issue96/en/news-03.html. [Last accessed on 2018 Jul 26]. WHO. Cancer Fact Sheet, Centre for Health Protection HK, Vital Statistics. WHO; February, 2017. HK Cancer Registry, Overview of Hong Kong Cancer Statistics of 2014. Available from: https://www3.ha.org.hk/cancereg/pdf/overview/Summary%20of%20CanStat%202014.pdf. [Last accessed on 2018 Jul 26]. The Chief Executive's 2017 Policy Address. Available from: https://www.policyaddress.gov.hk/2017/chi/policy_ch05.html. [Last accessed on 2018 Jul 20]. National council of state boards of nursing. J Nurs Regul 2017;7:4 Suppl:S2-36. Parker J, Hill MN. A review of advanced practice nursing in the United States, Canada, Australia and Hong Kong SAR, China. Int J Nurs Sci 2017;4:196-204. Hong Kong College of Medical Nursing Limited. Available from: http://www.hkcmn.com/web/index.asp?Lang=en& Page=Info_AboutUs. [Last accessed on 2018 Jul 26]. Lennan E, Vidall C, Roe H, Jones P, Smith J, Farrell C, et al. Best practice in nurse-led chemotherapy review: A position statement from the United Kingdom oncology nursing society. Ecancermedicalscience 2012;6:263. Principle Statement: Shared Care. Cancer Research in Primary Care; February, 2016. Victorian Cancer Survivorship Program: Pilot Project. Survivorship Program for Patients Completing Definitive Breast Cancer Treatment Final Report; 2014.